Daily Illuminator: Wrap Up Your Holiday Shopping With The Munchkin Gift Pack! November 1, 2017: Wrap Up Your Holiday Shopping With The Munchkin Gift Pack! Wondering what to get the backstabby friends in your life for the holidays? (We aren't talking about bad friends, just Munchkin fans!) Wonder and wander around shopping no more! 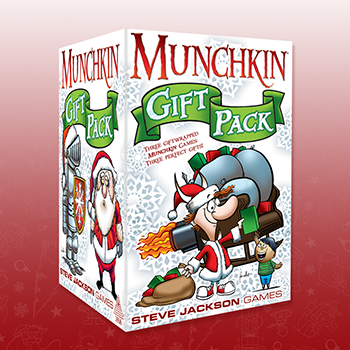 This month, we'll release the Munchkin Gift Pack, which includes three individually gift-wrapped games. As a bonus, we've added five new Munchkin cards illustrated by Len Peralta, along with a holiday greeting card! This will take a lot of the guesswork out of your Christmas shopping, making it a cinch to get through your list. You can gift these wonderful Munchkin games to your favorite people, or keep them - we won't judge! Munchkin Lite is great for smaller groups that want the same dungeon-crawling, pun-making, backstabbing Munchkin madness in faster games. For the fan who loves games with evil stepmothers and wolves disguised as grannies, try Munchkin Grimm Tidings, based on the Brothers Grimm fairy tales and illustrated by John Kovalic! If your favorite munchkin loves adorable art and books about kids at a wizards' school, give them Munchkin Spell Skool, illustrated by Katie Cook. If you're like me and leave holiday shopping until the last minute, the Munchkin Gift Pack is a great fit for you because the games come perfectly wrapped. You don't have to worry about buying wrapping paper, or exactly lining up the edges on the box. (I can't be the only one who struggles with that!) All you have to do is stick one of the enclosed gift tags on the box, scrawl in your friend's name, and go. The Munchkin Gift Pack will be available soon; look for this awesome shopping-relief item at your friendly local game store, or head over to Warehouse 23 to preorder! Speaking of gifts, the remainder of our Holiday Grab Boxes are available on Warehouse 23, in very limited supply, so get them before they're gone! And don't forget; the Munchkin Starfinder Kickstarter campaign is also going on right now, and ends soon. Don't miss out!